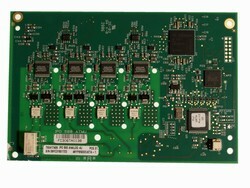 The IP500 Trunk Analog 4 Card (700503164) functions as an attachment to other IP500 base cards to optimize their performance by increasing their functionality. The IP500 Trunk Analog 4 Card is compatible with the IP Office 500 Digital Station card, IP Office 500 Analog Phone base card, and IP Office 500 VCM card. This card is compatible with the current IP500 Avaya IP Office system.